The old Toshiba LCD TV and basic Panasonic surround sound just weren't cutting it anymore for our living room family viewing experience. Time to upgrade! I've largely ignored television and home audio products for the last ten years. The new thing is always on its way to shelves about the time you buy anything. In my twenties I could have told you all about what was in store and on the way to stores. I find all things tech fascinating, so before the kids came into our lives, keeping up with that stuff was just part of my fun. I also made my living for fifteen years in the wireless communications industry, so attending the annual Consumer Electronics Show (CES) was part of my routine for many years. Well things have progressed dramatically since I was last tuned in and I had a lot of learning to do for my shopping adventure. Where better to start than online. I browsed and browsed for a week. The first thing that caught my attention is the vast price drops compared to what I remembered. You can really buy some nice home theater electronics for very reasonable prices. But I wasn't looking for just nice or ordinary. I wanted to upgrade to a superior home theater "experience"! After browsing the web and reading hundreds of reviews I decided it was time to head to the local Best Buy store. You really need to see and hear to be able to know what your dealing with right. Well the nice guy in the Magnolia Center there at Best Buy did just that, and wow did he impress me. I went from thinking bang for the buck online to realizing we could have the living room rocking on par with a movie theater. That would also include spending a small fortune. So I let my excitement simmer down a little and got back to focusing on what we really needed in a living room home theater system. We've always had good luck with our electronics purchases functioning well for long periods of time. I don't know if that is because I always do my research and make good quality purchases, or if its just been good luck. Since televisions range in price so much I made that my initial focus. Well after going through learning a new language, including QLED, 4K, HDR, OLED, 3D, Ultra HD, Smart, Curved, UHD TV, among others, I had it all figured out. Not! I was truly perplexed about getting my head around the viewing experience of a $999 screen and a $3,499 screen, trying to tell the difference. I started focusing more on what we watch most and what the user experience was like on the built-in onscreen menus. We mostly watch Netflix, Prime, and DirecTV. There's not a gaming system played in the living room and we definitely aren't sports fanatics. It all boiled down to what picture looked the best and how the menu operated, then one particular TV caught my attention. The LG OLED C8 Series had all of the acronyms, but that wasn't the hook for me. With this TV I could actually "see" the difference. The black levels are true black and I could see what a huge difference that made. Our current old Toshiba was very shabby when it came to watching what I would call dark scenes in shows. With the LG OLED every single pixel on the screen operates independently, so you get a spectacular representation of every detail. I was hooked. As I mentioned previously, we don't upgrade or replace our home tech very often. So this TV purchase represented the one we will have for hopefully a very long time if our luck remains the same. Buying something with this level of advanced technology will mean it stays current longer. So the relatively expensive 55" LG OLED C8 - 2160P - Smart - 4K UHD TV with HDR it was! Best Buy currently had a sale going for $500 off the regular price. I took the promo sale with a grain of salt though, because I knew the sale price was ultimately going to be the new price and in a month or two it would be another $500 lower. This was the only one that checked all of the boxes and really tugged at my emotions! With the TV picked out it was time to look at home theater audio to go with it. The hard part was out of the way right. Wrong! 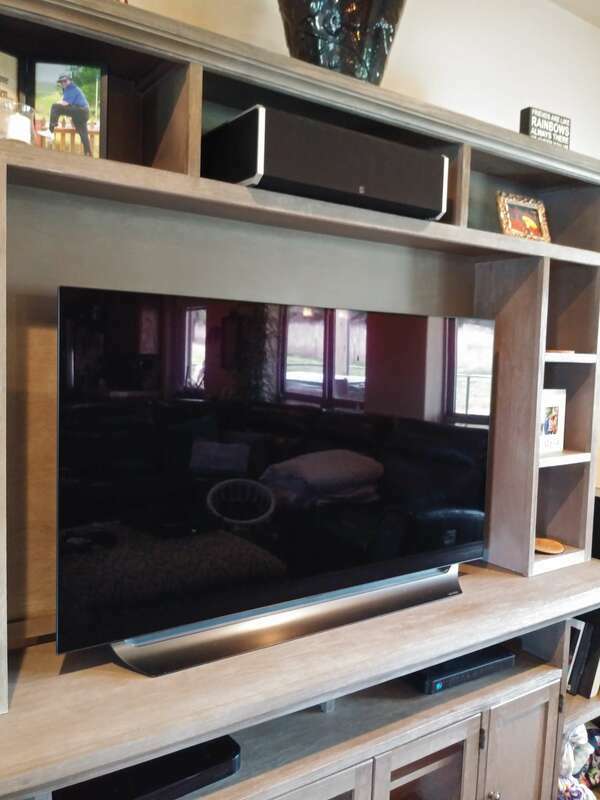 At first I thought a sound bar and subwoofer would be a fine compliment for viewing enjoyment. So I bought the latest Bose Soundbar 700 and the Bose Bass Module 700 Subwoofer. I thought it was a little pricey, but with Bose reputation for high quality sound I thought just maybe it would do the trick. The Bose setup came with an optical cable for connection to the TV so we were all set. It was exciting setting everything up. I couldn't wait to sit on the couch and check out the new experience. Well the TV was spot on, but the sound was less than exciting. For some reason the Bose audio played music far better than it generated sound for movies or shows. I tweaked every setting and kept thinking there must be something wrong. Ultimately I don't think there was anything wrong with the Bose system, it just wasn't anywhere near the listening experience I was looking for. So back to Best Buy to return the Bose soundbar and subwoofer. I visited with the Magnolia Center guy again and he said he was surprised that I found the Bose lacking, but that he had something that might just do the trick. A Definitive Technology soundbar and subwoofer that had been selling for $1,299 was on sale for $499. I immediately questioned whether a unit apparently on clearance could do the job. He spoke so highly of the unit that I decided to give it a try, because hey if this doesn't foot the bill the cost points are going to rise dramatically getting into the component audio game. The Definitive Technology soundbar and subwoofer did sound tremendously better than the Bose. I was pretty shocked by that considering I paid much less than half for the Definitive Technology soundbar setup. Unfortunately the new getup just didn't create the listening experience I had hoped for either. I had to face that the seemingly simple and affordable solution of a soundbar wasn't going to cut it. So back to Best Buy to return the Definitive Technology soundbar package. I was determined to select a system that would match the awesomeness of our new LG OLED TV. Into the Magnolia Center sound room again to look at the big boy toys. I had my twelve year old son with me and he thought it was funny how much effort I was placing into all this. When I showed him a single tower speaker that was $3,500 he perked up and said "okay I see why you are being so serious about it". We rocked out the sound-room for about an hour listening to different system combinations with different movie samples. The ridiculously expensive gear sounded wonderful, but I still had to justify my purchase to the wife and I honestly couldn't have done that with most of what we were testing. The speaker components that really stood out to me as a value were the Definitive Technology. I wasn't hearing a real major difference even compared to speakers two and three times more expensive. The Definitive Technology BP-9040ST tower speakers stood out to me in particular. A pair of them by there selves created amazing sound that could get louder than we would probably ever push them. They actually have an eight inch powered sub built into them. It's hard to explain, but the design of the speaker has something called Bipolar Array that gives the sound a very surrounding feel about it. The price was right and I was hooked for getting a pair of the towers. There is a matching center channel speaker, the CS-9040HD, so that is what I went with. I also wanted to have the bass reproduction well covered and the Definitive Technology SuperCube 2000 fit the bill for that. The dedicated subwoofer has a lower frequency response than the towers and is able to produce a much wider level of bass. I quickly made all of my emotional justifications for the add on sub! The last step was a new home theater audio receiver to hook all these cool speakers to. I didn't want to skimp here, after all the audio receiver is the brain for all of this audio awesomeness. I went with the recommendation for the Denon AVR-X2500H home theater receiver. It has all of the current tech built in and every input and output I would ever use. The sound wattage output was also a good match for the new Definitive Technology speaker system I was buying. I thought the audio receiver was the last step, but don't forget the cables and speaker wire! Oh my, you can spend a small fortune on quality cables alone. My experience with technology made me an easy sale on those. I simply wasn't going to buy very nice audio components and then connect them with sub par wiring. There is truly a difference in the levels of quality. Basic cables and wire can dramatically alter the performance of high end audio and video equipment. AudioQuest is a premium line of cables and wires that Best Buy carries. I was familiar with AudioQuest, otherwise I would have been very skeptical about the prices. I did however choose wisely among the various so called quality (grades) of each wiring item. The price points are named cleverly as Pearl, Cinnamon, Chocolate, Vodka, and Diamond among others. The AudioQuest Cinnamon line was right on par for my taste! I truly think the lowest priced AudioQuest products are probably just fine in 99% of cases. Everything was in stock so we were able to take it home with us! We rushed home to unload and both my sons and I got right down into audio installation euphoria. One key tip with high quality audio component wiring is that you want to look at the cables or wire to determine if they are directional. You will see an identifier on the sheathing with an arrow or some indicator if they are. Hard to believe that the direction each end of a cable or wire is connected could really matter, but there are dynamics of the way audio and video signals travel that it does make a technical difference. So we connected the HDMI cables, optical cable, sub line level, speaker wires and plugged everything in. WOW! The house was a rocking and we wouldn't have even heard you knocking. The level of sound was everything I imagined. We started testing some movies and then to YouTube to play some of theater sound intros like THX and Dolby. This is so awesome! The last step was to optimize the settings of the Denon home theater audio receiver. There is a cool setup process where you plug in a microphone into the audio receiver and it walks you through steps on screen to automatically adjust the audio settings to optimize them for the room. It has you move the microphone to various places in the viewing room and then plays a series of sounds to calibrate everything. The LG OLED C8 television paired with the Denon AVR-X2500H and Definitive Technology speakers delivered everything and more that I imagined when I started this shopping journey. We truly have emotion inspired watching the vivid screen and having sound that puts you right into what you are watching. The wife loves it too, but she just can't understand all of the fuss I went through over the details. 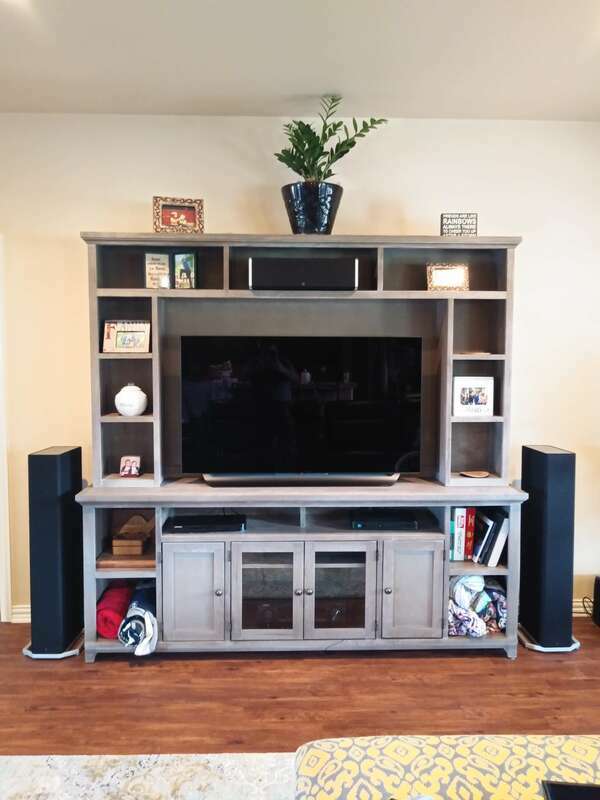 That is fine by me because I know that every part of the selection was very important in deriving the perfect home theater experience for our living room. ​Not a single ounce of buyers remorse here. 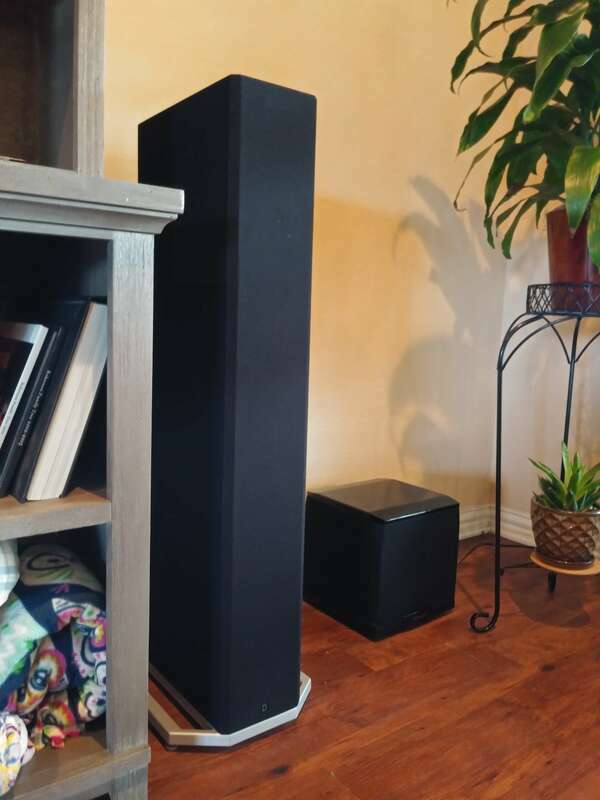 I feel even more confident in the purchase because the Definitive Technology speakers and powered subwoofer have a manufacture five year warranty on the speakers and three year warranty on the electronics within them. We are all set for years of enjoying an amazing experience every time we view anything in the living room! Hope you enjoyed the recap of my home theater shopping adventure! Harvey has always been a technology enthusiast, but his two sons are catching up fast. Gaming has been added to the mix with two teenagers in the house!